The Cofradia de la Immaculada Concepcion Foundation and Intramuros Administration are jointly holding the annual Grand Marian Procession December 4, this year. 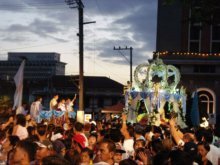 The procession, held every first Sunday of the year, kicks off 4.00pm from the Manila Cathedral, which has always served as its starting point. The procession ends with the traditional Te Deum in front of the Cathedral. Meanwhile Triduum Masses in Honor of the Immaculate Conception, which shall each start at 11.30am, shall be celebrated November 30 and December. 1 & 2, also this year, at the Manila Cathedral. More than 80 Marian images from various parts of the country participate each year, including Metro Manila's venerated and canonically crowned images of Nstra. Sra. De Lourdes from the National Shrine of Our Lady of Lourdes Kanlaon, Quezon City; Our Lady of Miraculous Medal, National Shrine of Our Lady of Miraculous Medal Sucat, Muntinlupa City; Nstra. Sra. De los Desamparados, Sta. Ana Church Sta. Ana, Manila; Nstra. Sra. De Peñafrancia, Our Lady of Peñafrancia Parish Paco, Manila; Nstra. Sra. De Consolacion Y Correa, San Agustin Church Inramuros, Manila; and La Immaculada Concepcion, courtesy of the Intramuros Administration Mater Purissima. First revived in 1980 after a brief hiatus, the annual procession, a joint project of the Cofradia and the Intramuros Foundation, representing the private sector and government, respectively, likewise involves the Armed Forces of the Philippines. The project has since been committed to giving assistance to the marginalized sector of the community. Among those benefiting from the annual event are public school students residing in impoverished areas, selected through the assistance of the parishes where these benefactors live. First communicants of such communities likewise benefit from the project as each is given outfits for the communion. Thru sponsorship of the Cofradia, each child-beneficiary is also provided with shoes and school bags with assorted goodies and school supplies. This year's communion for first-timers shall be conducted December 3 at the Manila Cathedral, 10.00 am, with Bishop Teodoro Bacani as Officiating Prelate. Five hundred first communicants comprise Grades 3 to 6 public school students from Baseco Elementary School, Baseco Compound Port Area, Manila. The Compound is under the San Agustin Parish in Intramuros, Manila, which conducts a continuous catechetical program every year under the supervision of its current parish priest, the Rev. Fr. Asis Bajao OSA. As early as the 16th century, the stand of the Philippine Roman Catholic Church was to accept the doctrine of the Immaculate Conception as an article of Faith, even while it was still permissible to question Anne's sinless conception of Mary. In fact, this was a primary factor in the endorsement of Pope Gregory XIII to build the Manila Cathedral consecrated to the 'Conception of the Blessed Virgin Mary' in 1578. After Pope V. declared that the doctrine was no longer open to question or public rebuttal, the first national celebration of the feast of the Immaculate Conception was held in the Philippines in 1619. On December 8, the first day of the 15-day event, festivities were held at the Manila Cathedral. The procession was only one among countless activities including bullfights, masquerades, carnivals, parades, band and choral concerts, drama and musicale shows. Fireworks and pealing of bells set off much of the revelry. In 1760, Pope Clement XIII authorized the celebration of the Immaculate Conception in the Philippines as a feast, having proclaimed Our Lady of the Immaculate Conception 'the principal patroness of Spain and the Indies.' From then on, the joyous observance became an annual tradition. Pope Pius IX defined the dogma of the Immaculate Conception and instituted the December 8 feast in 1854. Subsequently, nation-wide festivities lasted for a year. World War II disrupted the annual event, and the celebration was revived only on December 8, 1954, when President Ramon Magsaysay led the first Marian Procession which assembled some 60 venerated and privately-owned images of the Blessed Virgin from all over the country. This established the standard for modern feast day celebrations. This year's celebration owes in large measure to the industry and religiosity of a veritable array of goodhearted persons and patrons, led by Ms Imelda O. Cojuangco, the Cofradia's Founding Chair. At the helm of this year's grand procession are Ms Aurora E. Eizmendi, Cofradia President; Don Conrado A. Escudero, Chair of the Cofradia Comite de Festejos; and Mr. Jose A. Capistrano, Jr., Administrator of the Intramuros Administration. This year's Hermanas Mayores include Cor Yulo Ebdalin, Lori Yulo and Baby Javelosa, who shall lead the Hermanas Mayores Mass at 2.00pm before the December 4 actual procession, at the Manila Cathedral, with H. E. Luis Antonio G. Tagle, Archbishop Archdiocese of Manila, as Main Celebrant.